Peach V-neck halter-top lined at the bust, neck straps, and back. 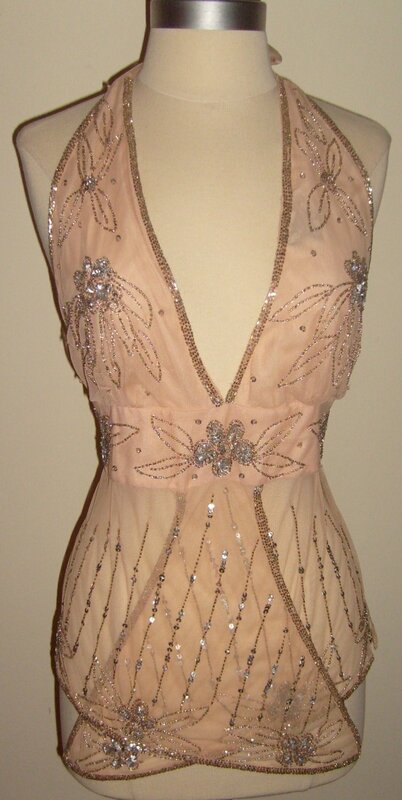 It is beautifully embellish with sheer overlay netting of sliver sequins and beads floral designs. The micro sliver beads are closely trim at halter-top and bottom overlap edge, which adds more sparkles. This halter is new without tag and in excellent condition. Contact me at thriftychicshop@yahoo.com or call 410-849-9649 and kindly visit to my blog thriftychicshop.blogspot.com .